If you’ve been around for a while, you know I’m all about that confident hand lettering style. But do you even know what a ” lettering style” means? I want to help you create your unique hand lettering style by showing you how to connect letters to create your lettering style. So what is a hand lettering style? It is more than just a font or alphabet that you use although that is the outward appearance. I shared some of my thoughts in this Instagram post. It is the reason why you letter, the purpose behind the quotes you choose, or how you confidently show up to practice no matter your experience level. When you are confident in your lettering style, it should feel like the very best version of you. It’s not the best version of me or anyone else, but YOU and that’s beautiful. Never doubt that your lettering is beautiful simply because it’s coming from you. Why am I talking about your hand lettering style? 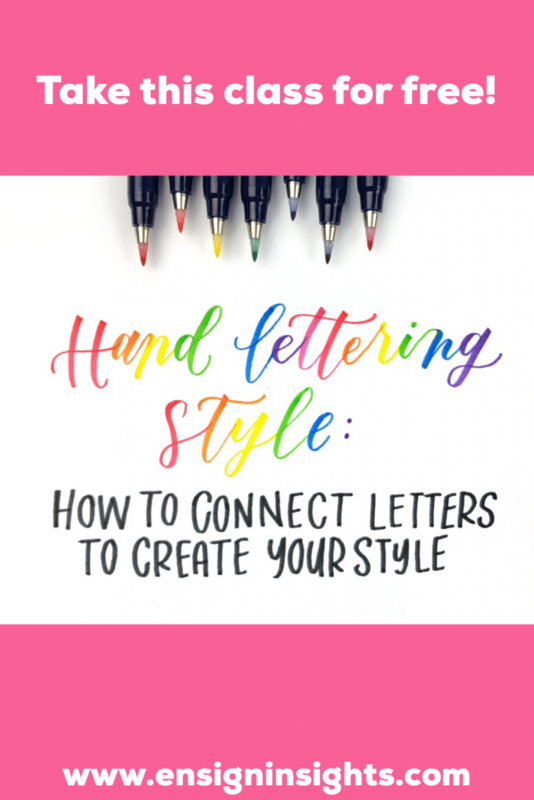 Well today I posted a new Skillshare class called Hand Lettering Style: How to connect letters to create your style. Of course the focus is on finding your style. But since that feels like a very general topic (one that I have a full, in-depth course about), I have focused specifically on lettering connections.If you have ever struggled with lettering connections, this class is for you. My goal is for you to see that there are multiple ways to connect letters. In this class you will explore the details and complete activities to find your favorites. You will be a step closer to your confident lettering style. This class is a module from Your Confident Lettering Style Course. If you need help deciding if you should enroll, this Skillshare class is a great start. Take this hand lettering style class for free! The class is just under an hour long (a great weekend activity) with 11 video lessons. I have also included a 9 page workbook so you can practice the activities and project along with the video lessons. All of that for free? Yep. I hope you enjoy it! P.S. I also have a Skillshare class about Lettering Videos in case you’ve ever struggled with filming and editing your videos. You could sign up for Skillshare and take both of them for free today.